Ok I know many of you have been waiting, so here it is the official back from Dog Scout Camp ;-) This is the more exciting one. This year was actually a very great year, we didn't get a whole lot of badges, only 5, but 4 of them really took a lot of work. We worked on 2 others as well but didn't quite get them mainly because Hemi and were both getting tired. 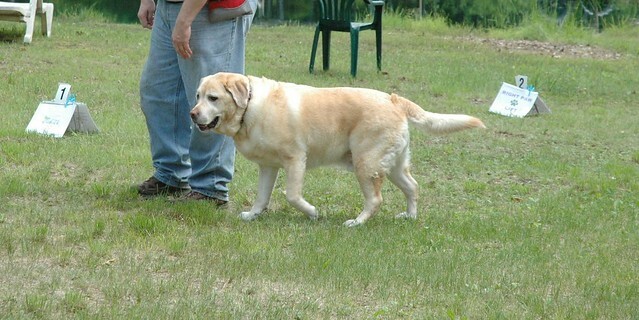 Hemi will be 7 soon and not the spry puppy he once was. a week of camping, and getting up and learning new things and heavy physical and mental activity from 8 a.m. until 8 at night takes a toll. Hemi was putting himself to bed every chance I he got. Camp started with Camp Photos in Uniform. I can hear the ohhs and ahhs now as every one loves a dog in uniform. All these years and Hemi is getting a pretty full uniform. This is his fullest side but the other side he has the bottom two rows as well. Every badge there is a memory from camp of us working together to accomplish something. Doing things I never even knew existed before I got Hemi. I even earned a badge this year just for me. They had one special made for me as the fire keeper. Every year I am usually the the one that builds the biggest and best campfires and keeps them going so this year at the end of camp I got my own special badge. It will go on Hemi's uniform too. Me and Hemi together. I am wearing one of my favorite shirts. Which BTW Snowshoe, thanks, if you remember you found the I Heart My Hemi Undies, while I didn't buy the undies, they also sold shirts and I got one. Then the hug. This is something Hemi does to me couple times a week. He comes up to where he can and puts his head on my shoulder and lets me just wrap my arms around him and give him a hug he may only hold the hug for 30 seconds to me minute but he initiates it and hold it. Luckily he did this in front of the photographer first hour of camp. Love my boy. Anyway, morning time. Normal start to camp. introductions and so on. Hemi being ornery Lively Hemi. Here we are having a conversation, and me telling him to be good. Which BTW if you notice the other side of me is Hemi's first love at camp. She was back this year. The spark does seem to have gone out of their relationship. She paid him no attention, he paid her no attention. There was no real love affair or anything this year at camp. Sadly labs who used to be numerous at camp were actually rare this year. 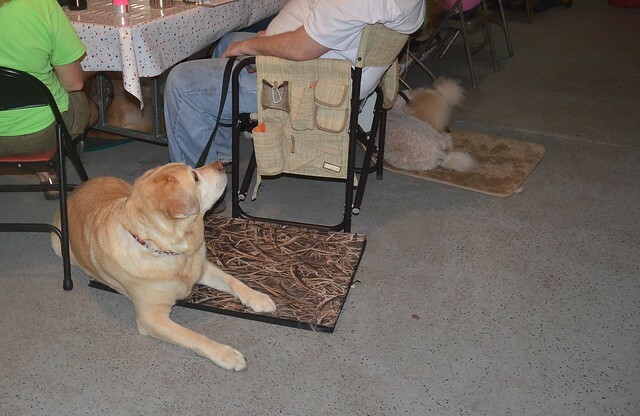 Hemi and Goldie were the only labs this year. Many may remember Apollo from last year who got birthday cake at camp. He crossed the bridge over the winter. 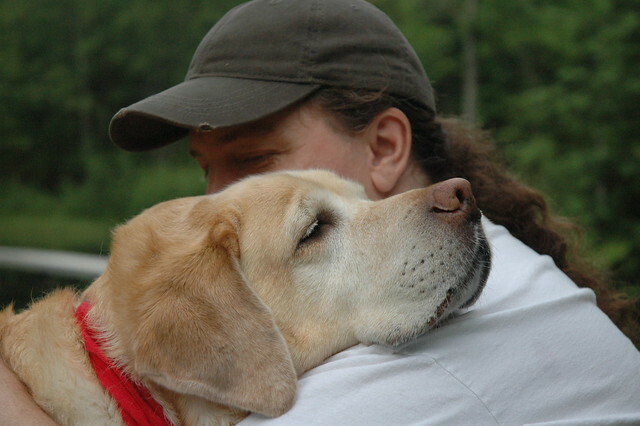 Sally who brings her 2 labs and golden didn't make it this year either. However there were some fresh new faces. We set a new record this year with the oldest new dog scout ever. We had a new member show up with a 16 year old dog first time at camp. 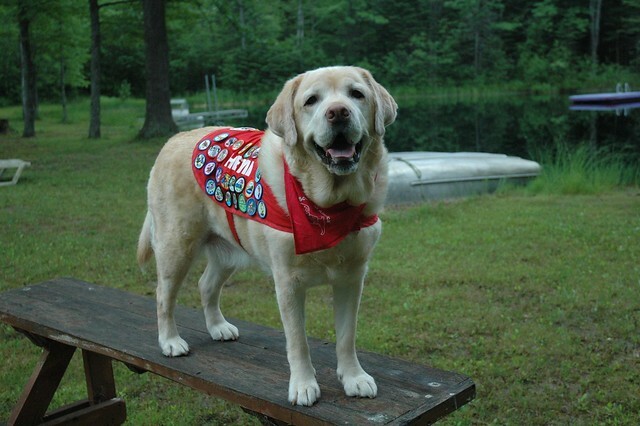 He not only got his dog scout badge but 5 other badges as well. Hemi was also not the biggest dog at camp, we had another new lady with Russian Wolfhounds. So I also teased Hemi calling him Teeny Tiny Hemi. So we got off to a good start at camp. One of the things we do at introductions is pass around a pair of lips. No one is allowed to talk unless they have the lips. Either Hemi really had something to say or was trying to get me to shut up. Oh and yes he is wearing a Micky Mouse Collar. So the first badge we, got, there are no pictures of. 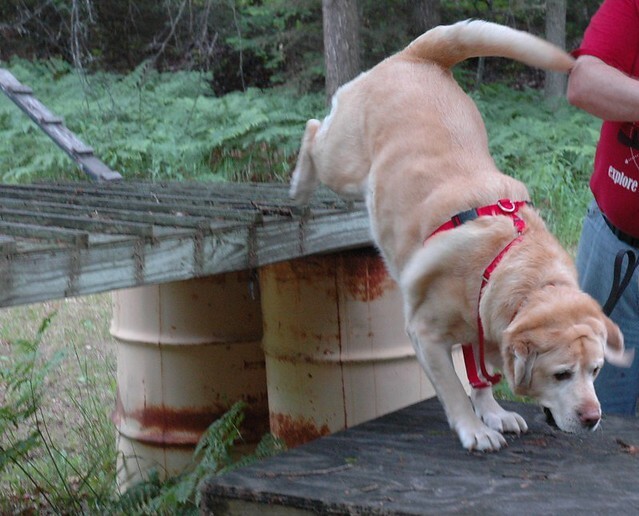 However everyone has seen Hemi dock diving before. Hemi finally got his dock diving badge. While he could always jump off he had to also climb up a ladder on the end of the dock back on the dock. Hemi would always just swim to shore and run back out. This year He climbed out. More on ladder climbing later. Another badge we got was Phodography. Which there are no pictures of either oddly. Actually last year we did the picture portion of this badge but the posing part was hard, which we got this this year. Posing Hemi basically had to learn to stare at another object for 20 seconds. It had to be lower than him on both side and higher than him on both sides. This is to get profiles shots. Think of the Watch command where you get a dog to look you in the eye. Same thing but this is looking at another object, not you, and holding the look at it. Also he had to be put in an odd position, then throw toys all around him and he not get out of the position. There is more tot he badge which we did last year, we just need to finish up some things. Next Badge we got. Ok this we were very proud of. Many of you may remember several years ago we tried for our rally free badge. However it was miserable. It was by the pond. I couldn't get Hemi to focus, it was really hard and we never got it. Last year they had it again and we got it last year. Well this year they offered the new one Intermediate Ralley Free. This is basically the same as participating and competing in the sport Rally Free and passing the Intermediate level. This is much harder as you have to work on all four sides of you complete a course with a qualifying score and under time, oh yeah and no treats. We started off good but as the week went on I was losing Hemi here. This was the last session of the day. So Hemi had already put in a full day work and was just brain dead and tired. He could do everything we just kept timing out. So the instructor had me come back first thing Friday morning. Fresh and ready to go and Hemi did everything perfectly. We passed the course with a really high score and with 45 seconds to spare. We were the only people at camp to actually get this badge. The picture is super tired Hemi on the course. Hey but also notice in the background the pond. I think we are finally over the distraction of the pond. I may dare to try canoeing again. Next was Treiball 2. Last Year we did Treiball 1. This is a sport where the end goal is 3 balls, out on the field. 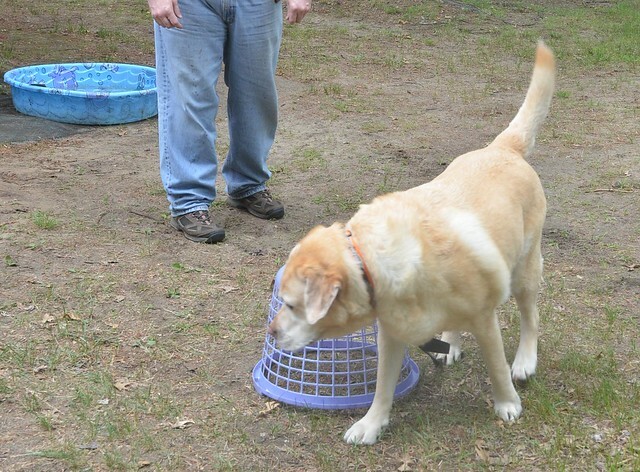 The dog has to roll the ball to you and into a net with his nose. 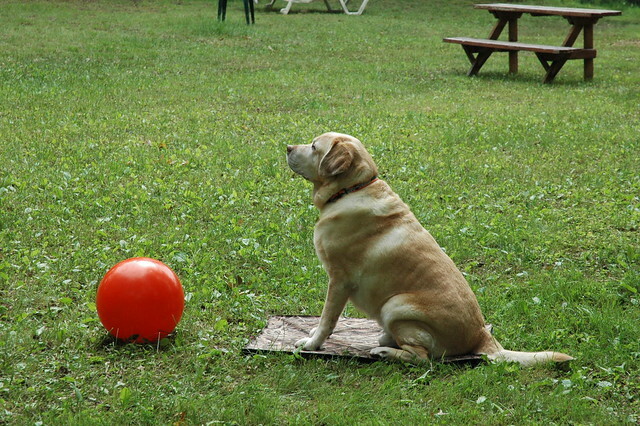 However it is not up to the handler or dog to choose which ball the judge chooses and you have to get the dog to do which one the judge chooses. 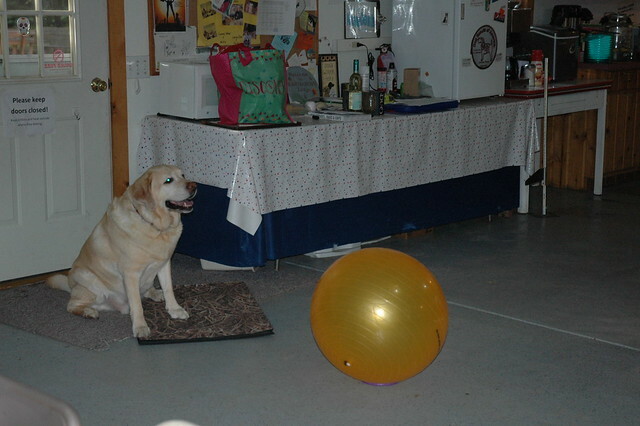 Here is Hemi Practicing, he has to go out and around the ball from me and then boop the ball to me. The balls in the final sport are all different sizes. The next badge was Parkour. Which is just like the Human counterpart. Basically the dictionary defines it the activity or sport of moving rapidly through an area, typically in an urban environment, negotiating obstacles by running, jumping, and climbing. 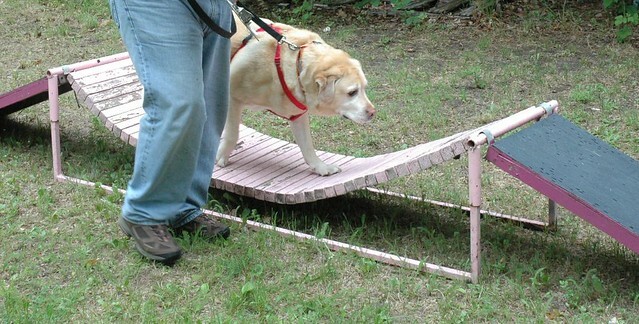 Basically as many of us know some of our dogs are like monkeys climbing and getting up on everything. 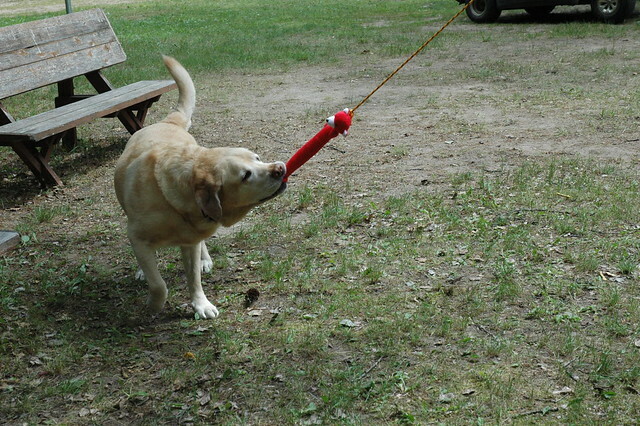 Hemi always did this he was a natural. For me the badge was pretty easy. Still a lot of work. 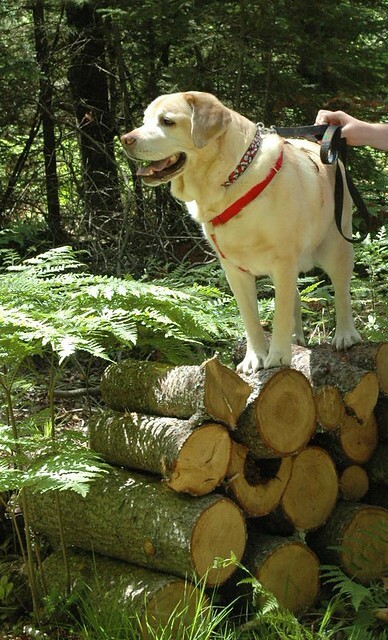 Every day we would go for walks in the woods, but these were not normal walks, the dogs needed to go out and around things on command, back up onto obstacles. Climb up unusual things, so it was definitely not a walk in the park. As you can guess this was a lot of fun having all these dogs walking along just jumping up and down and getting on everything. Some of the shots of Hemi out on things, going around things etc. They had to do things like get in a box smaller than them. Hemi did it but that poor box exploded when Hemi decided to lay down. The badges we didn't get but were close, Search and Rescue agility Jumps, tunnels, and ladders. The biggest problem with this course was it was right after Parkour. Hemi just spent an hour out climbing all over nature, not he had a bunch of defined obstacles. The last day there were some very large jumps basically 3ft mid air from one platform to another and so on and I decided not to do it. Hemi was pooped and exhausted and didn't want to risk him getting hurt. However we will be trying again. 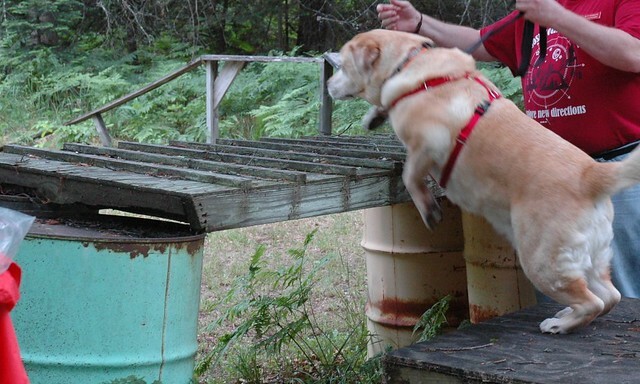 This has a very defined set of things the dog has to do, climb ladders and go through small obstacles and climb and jump on unstable items, safe items but where they might move and so on under their feet. This was impressive to see Hemi do some of these things. The tunnel for example. Basically, you have the dog lay down in sphinx position. Measure height at the withers, Hemi is 14 inches then they have a rig where you can build a wooden tunnel, 14 inches high, solid 2 by fours on top, woof on the bottom and plywood on top 16 feet long. Hemi went right in and climbed all the way through. No problem. A more realistic suspended ladder, this is made out of tires, suspended off the ground by the chains so free to swing. Jumping from one shaky platform to another. The platforms were stable to where they wouldn't fall over, chains and so on wouldn't let them fall over, but they were shaky and wavy. So this is why at the end of the day towards the end of the week, Hemi was too tired to just do some Rally Free dancing. He was more like come of dad let me get a nap. 1 hour of Parkour followed by 1 hour of agility all over different obstacles. To End as you always end on a positive note. The Arts and crafts this year. The first one was a leather bracelet, which they always make sure to get me manly things, I don't have a picture of it but it is just nice brown braided leather and then scented with essential oils to keep mosquitoes and so on away. The second was a flirt pole. The 3rd, I don't know, I fell asleep in the RV and slept through it. Here is Hemi playing with the flirt pole. Then lastly, I will share a picture of Goldie. 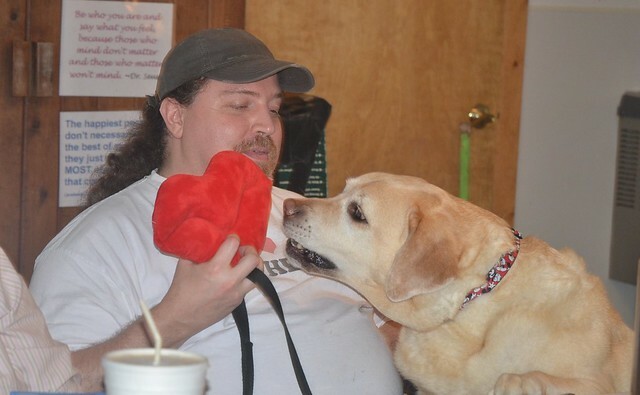 Labs will always make you laugh, and this year I really laughed a lot at Goldie. She is just reaching that perfect age of I don't care as long as I am having some fun. Her mom has a Polaris ATV, 2 seater, camp is quite large I forget how many acres. Most everything can be traversed with the 2 camp golf carts but the woods and so on and all the trails we usually have an ATV on hand just in case anyone gets hurt or something out in the woods on the trails. This year I got to see Goldie any her mom going down the trails in the Polaris. Goldie has a harness and special seat belt. 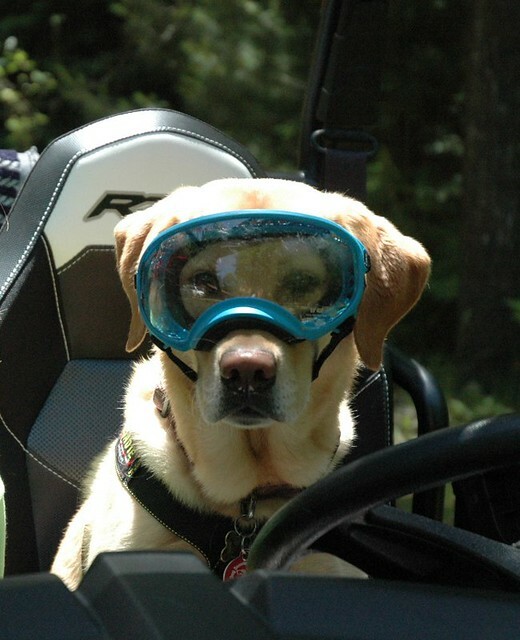 Oh yeah and her trail eye goggles. As we know Safety first. Edited, I forgot to add, I think I have mentioned before they bring in a masseuse for massages as well. This year they also had a doggy masseuse, So Friday night I sprung for long relaxing couples massage for just me and Hemi. Last edited by Jeff; 07-06-2018 at 03:54 PM. 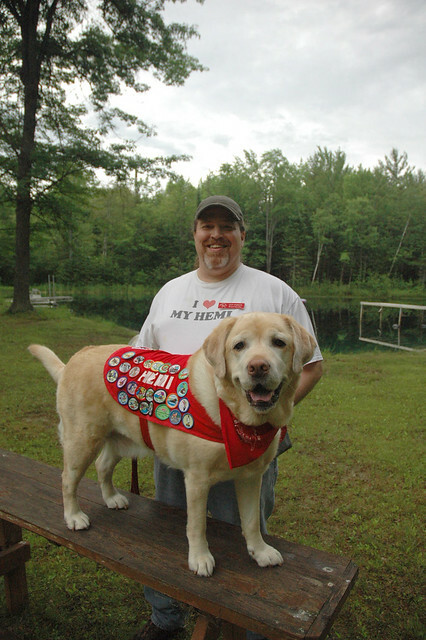 See Hemi at dog scout camp is always one of the highlights of the year for me! Thanks for the recap!!!! That all sounds great! And I can't help but giggle a bit at the thought of you and Hemi at your couples massage! Who wouldn't go for that? Did Hemi enjoy his massage? I think this must be the busiest dog scout camp, at least in my memory. I would say I got tired just reading it all, but not bored. You learn so many things I've never even heard of, to do with your pup. You guys are amazing. That looks and sounds like so much fun...you definitely have the right partner for all of those activities. And I'll bet you're wearing those undies and just don't want to 'fess up. Looks like another very successful Dog Camp this year! Hemi, don't let Dad tell you your getting "old", you're just getting more selective in what you want to do. Thanks for sharing Jeff. Always, always enjoy the pictures and tales of the adventures. Thanks for sharing! I need a nap just reading about your week, lol. 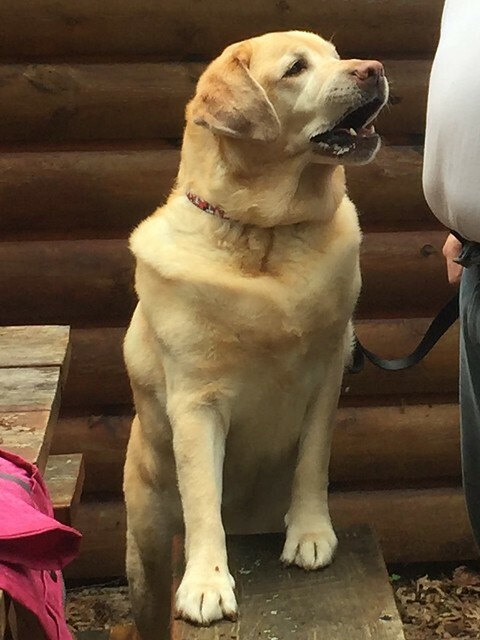 I'm currently visiting my parents in Michigan and I think your report has convinced them to get a dog and go to dog scout camp! Did Hemi enjoy his massage? Yeah he did, he wasn't too sure about it though. Some stranger just rubbing him all over. He kept wanting to get up and kiss them back and see them and so on. But when we got back to the rv he was like melting into the bed and relaxed. Next year you come to Michigan in June and visit parents week after YOU go to dog scout camp. You have 2 fun loving labs that would love it.